Crispy grains of toasted rice cereal covered in chewy melted marshmallow. A mix of melted marshmallow and Rice Krispies. Contains 4 bars, 28 grams each. Can be enjoyed by the whole family. Enjoy as a mid-morning nibble, lunchtime treat or on the go snack. 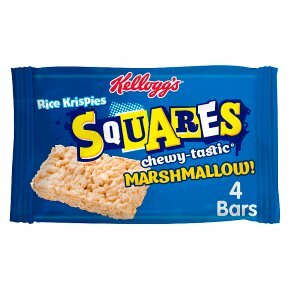 Our classic Rice Krispies Squares gets a marshmallow twist. Toasted Rice Krispies are covered with rich and gooey melted marshmallow, resulting in a sweet snack that melts in the mouth. Great for lunchboxes, after-school snacks, or anyone in the family who fancies a little indulgence at snack time.